It's not much of a secret that I've never really been that interested in politics...I outwardly relieved when I didn't get chosen to attend Girls State in high school and wasn't even registered to vote in my current county of residence until just recently. I think I registered Independent when I was in college (ya know, that whole 'independence' thing you experience when first going off to college), but pretty sure I never actually voted. Maybe it's just part of getting older that I'm getting a little more interested (a.k.a. concerned) with who will be elected our next president. Maybe it's just part of seeing how much damage a president can do in 8 short years. Maybe it's just part of now being a mother and having my daughter's future to be concerned with as well as my own. Whatever it is, I am certainly getting more 'interested' these days. Yesterday, Hillary and Chelsea Clinton came to Yankton and when my boss asked if anyone was interested in going to see her (she was scheduled to speak during working hours), I was actually excited by the prospect of seeing them IRL. I'm not saying that I'm voting for her (we'll see...:-)), but I do have to say it was different to see them speak in person and adds another element to the equation. I guess I'm just kind of small town, but being around that many men in black suits with guns (which of course were loaded and ready to fire), security guards and metal detectors was a little unnerving for me. We got there a little late and almost didn't even get into the room where they were going to speak. The main area was packed, but they finally decided to let more attendees into a balcony area. It was only a good view if you were in the front, but I managed to sneak my way in there a few times. It's funny, but they both seemed 'smaller' than I expected...maybe it's just because people you see on TV all the time seem to be 'larger than life' in a way. Then, when you see the in person, you realize they really are just people after all. It was an interesting event. 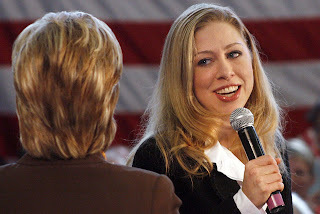 Clinton voice went out on her twice during the speech and she had to call on Chelsea to continue speaking...it was obvious that Chelsea is also well-versed in the principles of her mother's campaign. While she didn't quite get the crowd as 'riled-up' as Hillary, she certainly is a good speaker. I would imagine she has a bright and exciting future ahead regardless of whether or not her mother makes it to the white house. 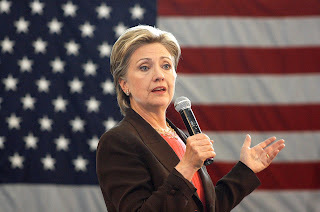 Despite these setbacks to the speech, she really does have some good things to say - supporting renewable energy, cutting tax breaks for big business, ending the war in Iraq and restoring alliances around the world...stuff that I can't deny that I agree with. It will be interesting to see what happens after today's SD primary.